April 15th 1894; despite the immense influence her records had on the shape and course of American popular music in the 20th century, the recorded legacy of Bessie Smith only captures part of her historical significance. Yes, her first recording, "Downhearted Blues" (1923) sold a then-astonishing 800,000 copies, and her subsequent Columbia Records releases throughout the 1920s earned her the title "Empress of the Blues" and influenced countless important musicians in the decades that followed. But by the time Bessie Smith made her first record, she was already a seasoned show-business veteran—an actress, dancer, singer, all-around force of nature and, eventually, the highest-paid African-American performer in the world, by many accounts. A monumental figure in her own time and beyond, the great Bessie Smith was born on this day in 1894 in Chattanooga, Tennessee. Orphaned at the age of nine and raised by her older sisters and brothers, Bessie Smith began singing and dancing for money on the streets of Chattanooga while she was still a young girl. She was 10 when her oldest brother, Clarence, ran off with a travelling vaudeville troupe, and she was 18 when that same troupe returned to Chattanooga in 1912 and took her on as a dancer. Eight years of showbiz training alongside that troupe's legendary singer, Ma Rainey isn't what gave Bessie Smith her equally legendary voice, but it did turn her into an all-around performer ready to headline her own travelling show. Smith was becoming the top draw on the black vaudeville circuit just as her first recordings reached the public, and though she received little or no royalties from any of her hit records, their popularity helped fill seats on the live tours that made her the wealthiest African American female performer of her day. The Empress of the Blues was also known for her rather colourful personality and lifestyle. She once survived a stabbing after a performance in her hometown of Chattanooga, chasing after her attacker with the knife still in her chest, then getting herself to the hospital and still not missing the next night's show. She had an extremely tumultuous off-and-on-again marriage, and was known to get into fistfights over lovers of both sexes. 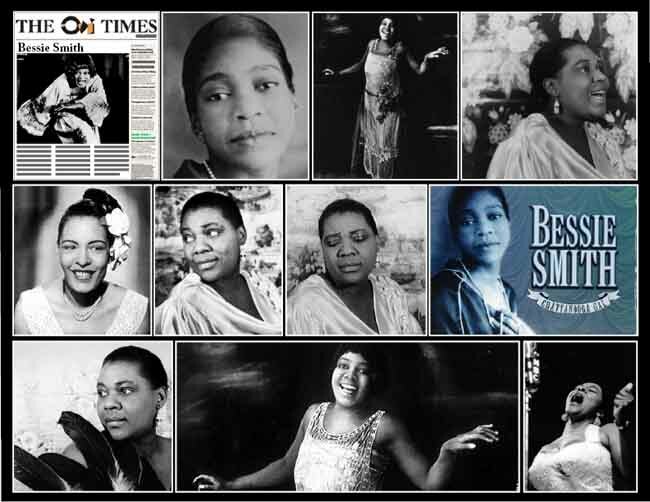 Two of the photos in the image collage above are NOT of Bessie Smith. The first photo in the second row is a studio shot of Billie Holiday, and the very last photo of a woman singing live on NBC Radio is also likely Billie Holiday.